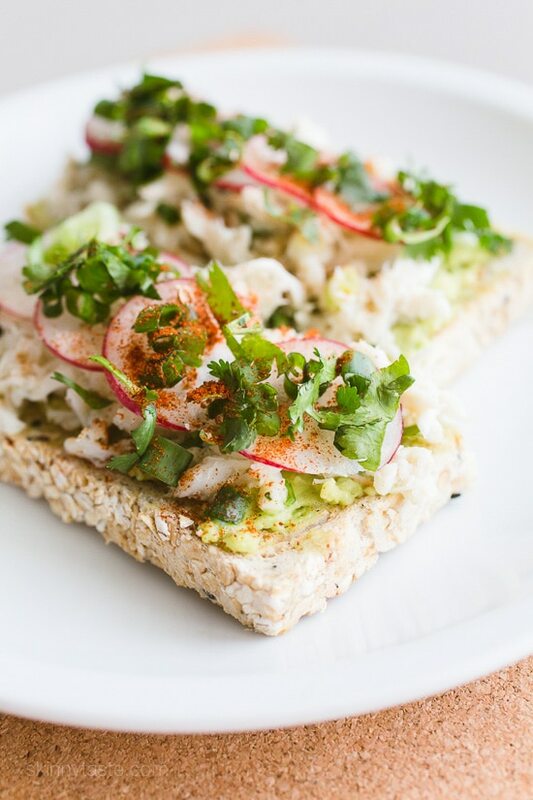 Fresh crab, sliced radishes, lime, paprika and cilantro elevate simple avocado toast to a whole new and delicious level! Hey there, I’m Heather. I’m a dietitian and the founder of www.heatherkjones.com — a weight loss site that focuses on healing and hope instead of diets and deprivation. I’m also the creator of Smaller Size Bigger Life, an online coaching program for women who struggle with emotional eating, overeating, or body image issues. So I’m a little (ok, A LOT) obsessed with avocado toast – mashed avocado on whole-grain bread topped with a drizzle of olive oil and a sprinkle of sea salt is one of my go-to breakfasts. 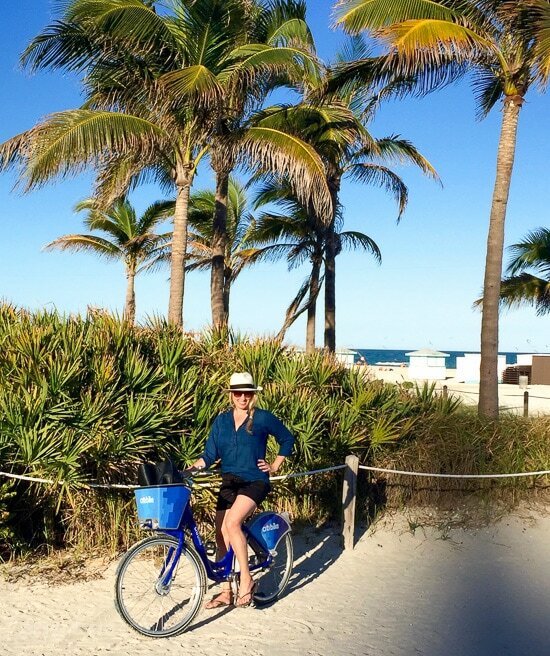 But on a recent trip to Miami I discovered an entirely new and fresh way to dress up this simple and healthy dish. This easy dish is not only perfect for breakfast or light lunch, but it’s also a wow-worthy brunch dish (trust me, your friends and family will be impressed!). In a small bowl, mash avocado with a fork until smooth. 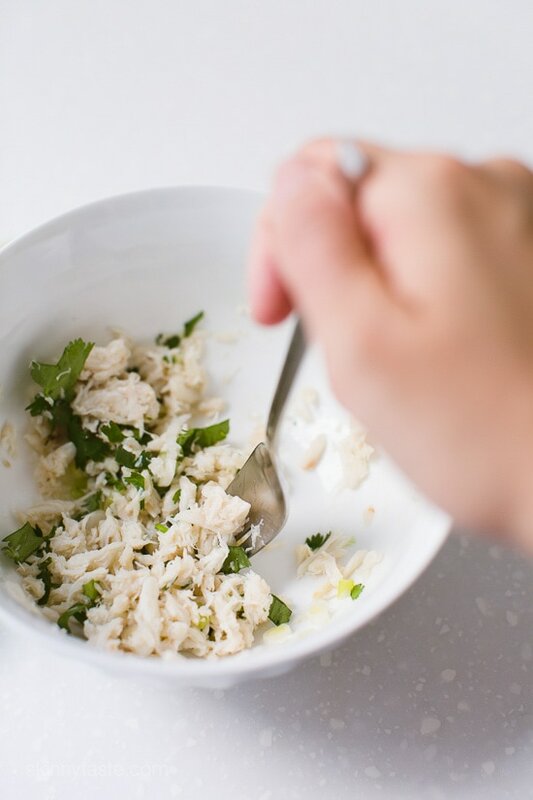 In another small bowl, combine crab, 2 teaspoons cilantro, lime juice, onion whites, pinch of salt and pepper. 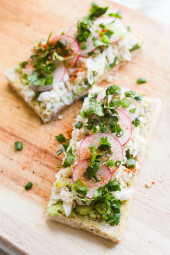 Spread avocado evenly over toast, top with crab mixture, radish, remaining cilantro, green onion, sprinkle of paprika, pinch of salt, pepper and a drizzle of olive oil. Cut in half and serve immediately. 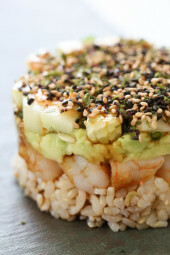 I have been wanting to make a recipe like this after having a delicious crab and avocado appetizer in New York. I am so excited to try the recipe this week! Gina! I love avocado on my toast! This sounds so amazing, especially adding the lime in the mix. Great recipe, I cant wait to try it! Thank you! Thanks for the wonderful recipe Heather. 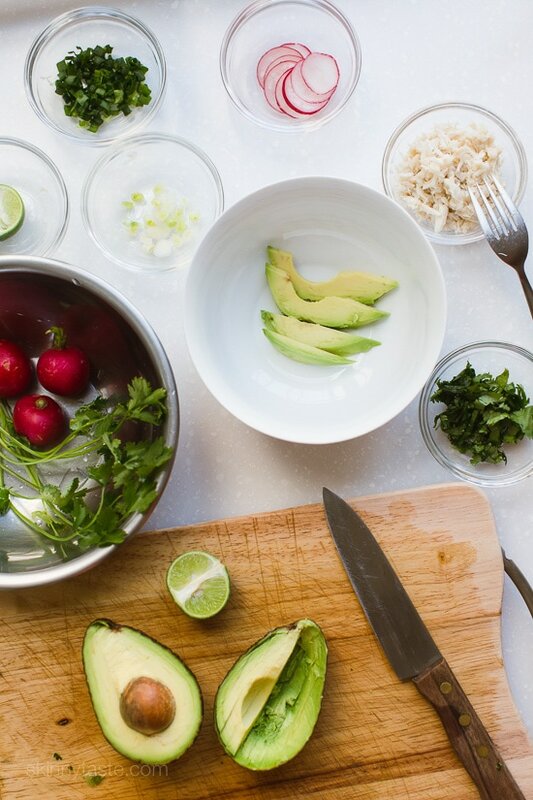 Between the lime, cilantro and avocado, it tasted like a fresh, healthy Mexican dish. You’re so welcome, Nick! Happy you enjoyed it. Hi Gina! I don’t really care for cilantro, but love all the other ingredients including the lime. Is there a fresh herb that I could swap in for the cilantro..? Thanks so much! Hi Hilary – you could try parsley. Where is the button that makes the PDFs? I like the new site but it’s way more confusing to navigate. This looks Delicious however!! I hope canned crab works as well for it. I generally make this with sardines on top of the avocado..
Canned is good, use the print button! Gina, I love the look of the new website, but I’m so sad that your recipes no longer automatically upload to Pepperplate. 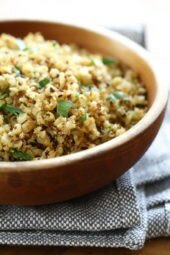 It’s definitely worth any hassle to upload your recipes because they are so darned good, but I sure miss the ease of uploading to Pepperplate from the previous site! I saw this today and had to make it! I didn’t have the exact ingredients on hand. For the crab meat I used canned wild salmon. I also didn’t have a radish so I used thinly sliced cucumber for the crunch. I’m sure it is even better with the original ingredients as written, but thanks for the inspiration! For those of you that have tried this…can you tell me if this is filling? I hate to go out and buy all the ingredients and then be sadly disappointed that one slice did not fill me. Thank you. 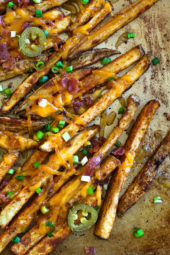 This recipe was so delish! Love all the mix of colors on the toppings too. Great one Heather! backward by date? I like to catch up on new recipes if I’ve missed a few days. Hi Gina, it seems the direction are just the description again, maybe? This sounds amazing! I eat avo toast every morning and have some crab in my fridge too… i’m making this tomorrow!